Heat oven to 350°F. Line baking sheet with parchment paper set aside. In large bowl, stir together cookie mix, pudding mix and flour. Stir in melted butter and eggs until soft dough forms. 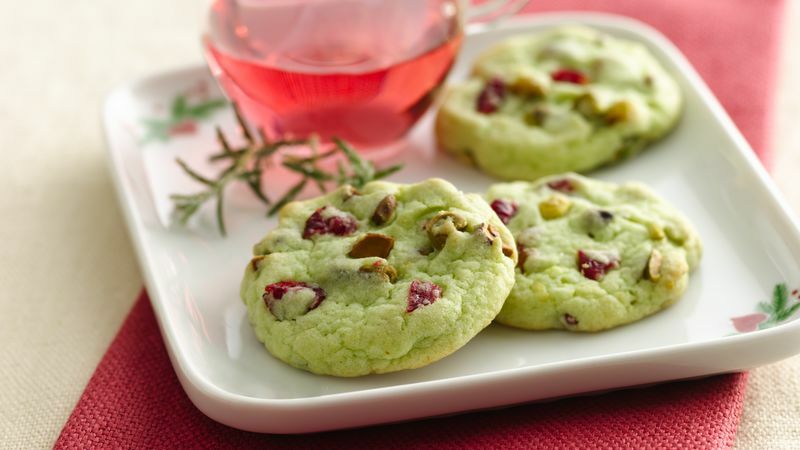 Add pistachios and cranberries; mix well. Using small cookie scoop or teaspoon, drop dough 2 inches apart on lined baking sheet. Press with fingers to slightly flatten. Bake 9 to 11 minutes or until edges are light golden brown. Cool 2 minutes; remove from baking sheet to wire rack. Cool completely. Store tightly covered at room temperature. Place food directly on parchment paper and bake as directed. Treats will bake evenly and release from paper with ease. Plus, because you're baking right on the paper, clean-up is a breeze. Success For even baking, make sure cookies are of the same shape and size. Purchasing You can find shelled pistachios in the nuts-for-snacking section of your grocery store.